so, I have been bragging about spontaneus flora from a while, and it somewhat feels strange this, but I am now involved in a garden project where in collaboration with Lucas and anybody else who would like to join, are going to somewhat grow things! yes, that’s right, actual seeding, planting, watering and minding.. or rather, tending. So, in view of the aforementioned exercise, I brushed up my knowledge of garden plants, the sorts humans have been crafting and selecting out of the wild counterparts since the start of it all: agriculture. About 10-15,000 years ago, in several parts of the continent, various inhabitant started to domesticate nature, animals and plants, instigating the process of delimitation of space, control of environments, property. Uhmm, we dont wonna go there with this post, but rather have a look at the selected species nowadays available commercially for our consumption. I did my own selection and in a twin posting between here and WeedyConnection’s blog, propose a list. I exert comments, suggestions and counter-lists. You have browsed the Diggers club for this selection, but more ca be found in other sites, like Eden seeds. Admired for their unique and complex flavour profile Marionberries have long been revered in the US. Their vibrant purple color packs a powerful nutritional punch that catapults Marionberries to the top of the antioxidant charts. With an underlying earthiness, hints of sweet and a lively tartness no berry garden is complete without one. Now, that’s a must if I was going to do any gardening, and just lucky the quarantine limitation is only for Western Australia! Create a column of fragrant sweet strawberries perfect for a sunny balcony or verandah. Includes one strawberry bag which can hold 10 strawberries and 10 Cambridge Rival strawberries for planting. Can produce 5 kilos of strawberries or up to 20 punnets! Water regularly in hot and/or windy weather. Use leaves in lamb and beef stews, slightly tangy, lemon flavor adds zest to salads and is especially good with fish and to make soup. Perennial with large, long, wavy, light-green leaves. Greenish yellow to red flowers in midsummer. This is funny, as I can probably point at wild rumex acetosa’s growing a bit of everywhere, so I might just do that, go and collect some seeds from the local variety in Callan Park (the park adjoining the Sydney College of the Arts grounds, where the garden is) and grow them both, see who does best. This is the true green basil favored by continental cooks. Grow half a dozen plants and you will have enough to fresh pick all summer, and to make pesto that you can freeze for quick pasta dishes in the winter. The perfect companion for your tomatoes. Yep, Basil, we gonna have some tomatoes for sure, so we need basil to grow beside them. Slate grey leaves topped by panicles of blue. Flowers and leaves can be added to summer drinks. 45 sds. Now then, this is a plant with which I have sentimental attachments. It grows wild in northern Italy where I grew-up, and from spring to late summer is the perfect plant to cook buttered, absolutely yummy! A mild onion flavour and can be grown as an insect repellent barrier. That’s another toughie, it would grow regardless, great finger food too. Not for the Tazzies thou. With bronze fern-like foliage, this fennel is as valued for its decorative quality as it is for its insect attracting ability. Non bulbing. 120 sds. And here is another one that I can pull out of Callan’s wilderness, grow beside and see what happen. Spearmint is used to flavour roast lamb and other meats, sweets, oils, jellies, drinks, and tea. It also is an attractive, spreading ornamental ground cover. Here’s another wild one, not restricted, but it will not have problems to settle and survive whatever. The yellow flowers and leafy shoots can be used to make a yellow-green dye or repel ants and flies. This one is for environmentally-friendly control of ants and mozzies, I’ll let Lucas with his freshly acquired Permaculture knowledge go off on the benefits of this one. A prized heirloom Butternut that sets the standard by which other pumpkins are judged. Classically shaped fruit with a small seed cavity so you get more usable pumpkin. Soft yellow flesh and a great nutty flavour. Harvest in 133 days, 6kg/plant. We have to have a pumpkin growin! it would go big, asserting itself on whatever space, looking glorious as a fantastic visual achievement to be proud of. I can already see a fantastic Pumpkin soup coming up in late autumn! Tall, green strappy form containing lots of biomass to incorporate into the soil after the grain harvest. Sterile hybrid that will not cause any weed problem. So, this is a man-made variety, which despite being reduced to a sterile being (uhmff), still is restricted. Sorghum is also one of the first crops human domesticated..now a threat. This sweet currant is the world’s smallest tomato, yielding hundreds of the sweetest fruits from mid summer to late autumn. If your kids won’t eat tomatoes, they will be converted after trying these little lollies (just don’t tell them they are tomatoes!). 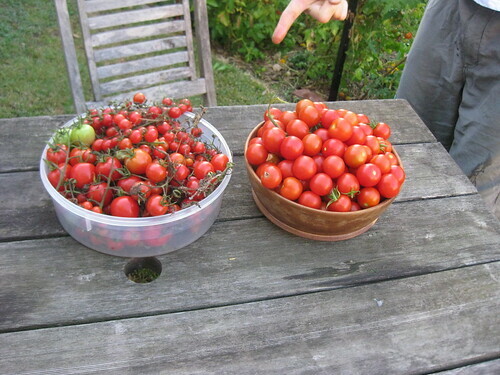 And finally, the Tomatoes!! I choose those ones as they are the kind that needs little to no attention, and yet produce proficiently small yummy finger food. This entry was posted in Uncategorized and tagged basil, blackberry, chives, garden, growing, legislation, mint, pumpkin, restriction, strawberry, tansy, tomatoes, weed by Diego. Bookmark the permalink. Thanks Linda – we’ll look into a subscribe thingummy when we get a chance to do technical stuff on the blog, soon! Can you point me to another blog which has the sort of thing you’re talking about? Yes, it’s fun to have Diego on board with his offbeat plant selections! yeh, also, thanks Lucas for inserting manually the name of the writer on each post, we’ll need to find an automated feature to do that for us. what else you think we should have there? we were talking about potatoes drums the other day..
boss, I love your list! Makes a change from the usual garden suspects! Eating, loving, singing and pooping are, in actuality, the four acts of the mirthful opera known as freshness, and they pass like bubbles of a grit of champagne. Whoever lets them break without having enjoyed them is a entire fool. …i just let the above spam comment through as I thought it was lovely, poetic and relevant! “bubbles of a grit of champagne” – wonderful. lol, this is funny lucas. i used to do that too, let spam throu, in the early days of my blog weedyconnection, kind of letting throu the ‘weeds’ of the web. eventually thou i had to stop, as it becomes an exponential exercise, if you let through one, 10 will come.. which i guess is a valid argument for the thriving reality of today’s environment, be it real or virtual.. Opening the floodgates you reckon eh Boss? Sounds ominously topical in the current political climate.